It seems that autumn is definitely upon us and TV reflected this with the return of a perennial favourite as well as a number of new comedy outings that will keep us laughing during the dark winter nights. The one show that best signalled the countdown to Christmas was Strictly Come Dancing which made its proper return to TV last weekend. After the launch show paired up the celebrities with their professional partners, the audience saw the results of three weeks' worth of rehearsals during the opening weekend. I'm not sure if I'm a big fan of spreading the first week's action over two nights especially as nobody went home after Saturday's show. But at the same time the marks that the judges give do affect the overall score and do in fact matter in the grand scheme of things. I do think that Friday's show did feature some of the sentimental favourites including housewives' favourite Daniel O'Donnell and likeable weather presenter Carol Kirkwood, the latter of whom was left languishing at the bottom of the leader board. However it was Saturday's show where things really kicked into gear thanks to an energetic routine from Ainsley Harriott and a show-ending number from bookies' favourite Peter Andre. It does feel to me that Andre is getting the most money out of any of this year's celebrities and therefore the producers are leaving his fans waiting as long as possible to catch a glimpse of him dancing. One thing I have noticed about this year's line-up is how weak it is and how at the moment there are a lot of contestants who don't add a lot to the overall product. While the likes of Kirkwood and Radio 2 presenter Jeremy Vine aren't great they're not providing the same sort of entertainment that was offered by wooden Judy Murray and woeful Scott Mills last year. Even Anton Du Beke has been given a decent partner this year in Proms presenter Katie Derham who appears to have natural rhythm and grace. Whilst there was a lot of deadwood in the line-up there were at least half a dozen celebrities who seemed like they had a decent chance of winning. This makes me excited that this year's contest is going to be a competitive one although I have a sneaking suspicion that Peter Andre's combination of ability and fan power will see him scoop the glitterball trophy. One good thing about Strictly is that it hasn't made any efforts to change its format and is all the better for it. I do think that sort of sense of stability is what's made The Great British Bake-Off so popular and the same can be said for Strictly. Claudia Winkleman has settled into her role as co-host brilliantly and even Tess Daly seems more confident as the show's main host. 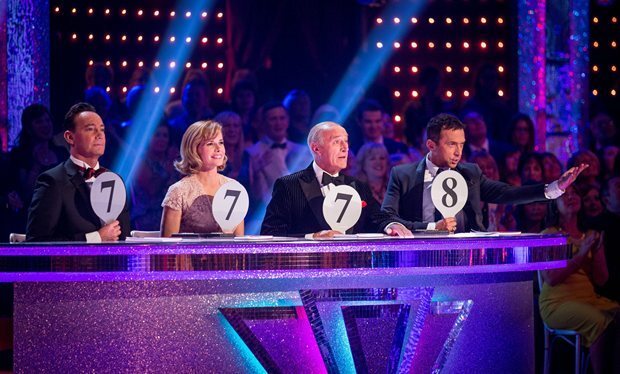 Meanwhile the judges' comments continue to be constructive with even the waspish Craig attempting to find some sort of positive aspect to most of the dances. More than anything I enjoy the sense of camaraderie between the contestants as there's the sense that all of them are in it together. I do like this aspect of the show and it disproves Simon Cowell's theory about the 'real world' being a place where everybody is competing against each other. At the end of the day Strictly is one of those shows that offers proper old school entertainment but does it in a way that doesn't alienate a younger audience. Ultimately, despite a weak line-up, Strictly is still the daddy of the Saturday night entertainment show and at the moment it doesn't show any signs that it'll be leaving our screens any time soon. 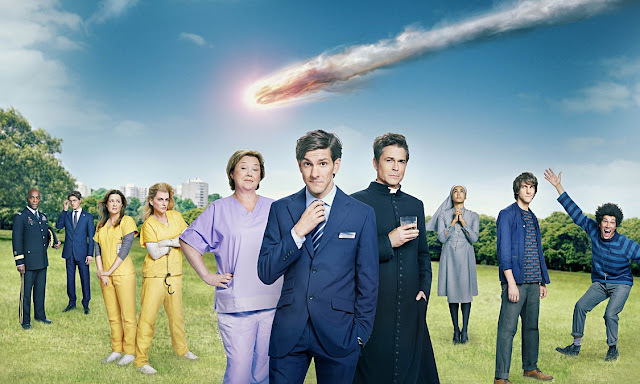 Moving over to Sky One now and the company's latest original comedy offering in the form of You, Me and The Apocalypse. From the off it was quite easy to ascertain that the show was a co-production between Sky and NBC as it featured several stars from the American network's biggest sitcoms. Despite the big American names the show is narrated by Slough Bank Manager Jamie (Mathew Baynton) who is still nursing a broken heart after his wife mysteriously disappeared shortly after their honeymoon. Things get worse for Jamie when he's arrested for cyber terrorism and discovers that he may have an identical twin who is the head of the organisation. This feeling is confirmed by his mother (Pauline Quirke) who reveals that she adopted him after finding him in a shoebox. As the story is told in flashbacks we also see several the stories of several other people who are sharing a bunker with Jamie as a meteor collides with the Earth. They include a naive nun (Gaia Scodallero) who arrives at the Vatican to work in the office of the Devil Advocate under the foul-mouthed Father Jude (Rob Lowe). Elsewhere we see Rhonda (Jenna Fischer) who takes the rap for a crime committed by her teenage son who hacked into the NSA network. Rhonda is soon befriended by white supremacist Leanne (Megan Mullally) with both ladies escaping prison once the end of the world is announced. The first episode of You, Me and The Apocalypse contained some big ideas and I felt it tackled them well for the most part. Writer Iain Hollands has come a long way since E4's Beaver Falls and has crafted some interesting characters who find themselves in bizarre situations. The cast, primarily the American stars, were great at handling the wittier lines of the script with Lowe and Mullaly being the stand outs for me. However, I was disappointed by Baynton who appeared to be playing the same character he portrayed in The Wrong Mans. Additionally I felt that the pace of the opener was rather slow which probably had something to do with the fact that it will be running for ten episodes. But despite this I would say that You, Me and The Apocalypse does have promise and I'll at least watch one more episode to see how it progresses. Following on from You, Me and The Apocalypse was another new multi-channel comedy, Marley's Ghosts which was of a number of original sitcoms that are to be produced by the repeat-heavy network GOLD. Unlike the Sky and NBC collaboration, Marley's Ghosts is an awfully traditional affair albeit one with a far-fetched plot line in which magistrate Marley (Sarah Alexander) finds herself plagued by a plethora of undead faces from her past. The craziness begins when Marley's drunken husband Adam (John Hannah) dies after choking on a chicken bone. When his ghost reappears at his own funeral, Marley starts conversing with him much to the chagrin of her colleague and lover Michael (Nicholas Burns). Michael's fury at Marley's situation leads him to be hit by the car of the inept local vicar (Jo Joyner) with both eventually dying and joining Adam as ghosts only Marley can see. It's clear to see that writer Daniel Peacock has primarily written for children's TV up to this point as Marley's Ghosts has a rather juvenile streak running throughout it. A lot of the jokes are quite obvious however I have to admit that I did chuckle quite a few times especially at a recurring gag involving a pair of randy pensioners. Despite a loopy premise and some corny gags, Marley's Ghosts was strangely watchable thanks primarily to its game cast. I particularly thought that John Hannah gave a better performance than the show deserved as Marley's depressed husband who realised the error of his ways after his death. Similarly impressive was Jo Joyner who gave one of her best post-Eastenders turns to date and she seemed to be having a whale of time as the kooky vicar. While Marley's Ghosts isn't going to win any points for originality it does give me hope that the people at GOLD know what they're doing when it comes to producing original content and I'm looking forward to what they have to offer in the future. Moving back to terrestrial TV with another sitcom this time The Kennedys which had the tough job of following Have I Got News For You on BBC One. The Kennedys is based on the memoirs of journalist Emma Kennedy and just like Danny Baker's Cradle to Grave takes us back to the 1970s. 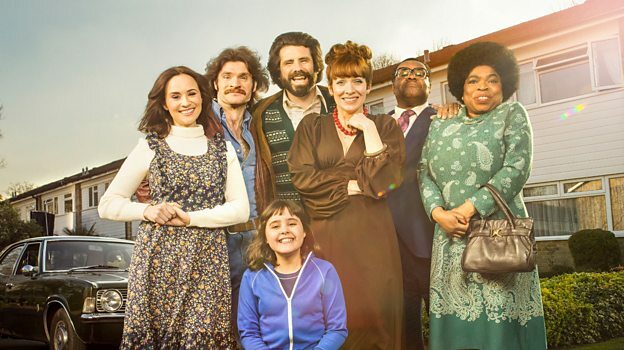 Unlike Cradle to Grave, the family in The Kennedys isn't constantly shouting at each other and instead Emma's parents Brenda and Tony (Katherine Parkinson and Dan Skinner) are relatively demure when compared to their friends and neighbours. The opening episode sees Brenda live her aspirations of hosting the first dinner party in their small neighbourhood of Jessop Square. Brenda then instructs Tony to make a lasange, something that baffles him due to the fact that he has to use pasta that doesn't come from a tin. Tony asks friend Tim (Harry Peacock) to try and help him track down some pasta only to discover that his mate is conducting an affair. At the same time Brenda learns that Tim's girlfriend Jenny (Emma Pierson) is pregnant and hasn't told her other half yet. This perfectly sets up the comedy goldmine that is the awkward dinner party which includes Tim spending the entire meal bare-chested and his lover walking in on the meal to threaten physical violence against most of the guests. I was surprised by how much I liked The Kennedys and I think it had a certain sense of innocence that you don't see in sitcoms any more. That may have something to do with the fact that the comedy has a pre-teen protagonist in Lucy Hutchinson's Emma, with the young actress proving to be a comic revelation. Meanwhile the reliable Skinner and Parkinson were an absolute delight to watch as the social climbing parents with the former pulling off a great Welsh accent. Whether or not The Kennedys can keep the momentum of this first episode going remains to be seen but on first impressions this is a refreshingly likeable old-fashioned sitcom. Continuing the theme of nostalgia I come to the first CBBC programme I think I've ever reviewed for this site however it's one that's quite dear to my heart. As somebody who grew up in the late 1980s/early 1990s Danger Mouse was a show that I probably watched almost every episode of. So it was with great trepidation that I approached the new series that aired all this week on the BBC's children's channel. After suffering through the sub-par Thunderbirds remake I didn't have high hopes but I was pleasantly surprised by what was on offer. Although the graphics were inevitably better than those offered in Danger Mouse's original incarnation everything else about the show remained untouched. I did feel that, unlike Thunderbirds are Go, Danger Mouse offered something for everyone with the central plot appealing to younger viewers whilst older children and parents would've liked the wicked humour employed by writer Ben Ward. I particularly liked the fact that the voice of Come Dine With Me Dave Lamb provided the narration as he added an extra comic touch to proceedings. He was also there to provide a little nod and wink to the audience at home especially at the end when he tried to debunk several aspects of the plot. In voicing DM, Alexander Armstrong had particularly big shoes to fill but I felt he did an admirable job. Although it was quite obvious to picture him providing the voice he still brought a mix of bravado and comic timing needed to pull off the role. However I thought the best contribution came from Kevin Eldon who provided a note-perfect Penfold voice-over which gave some added authenticity to the piece. 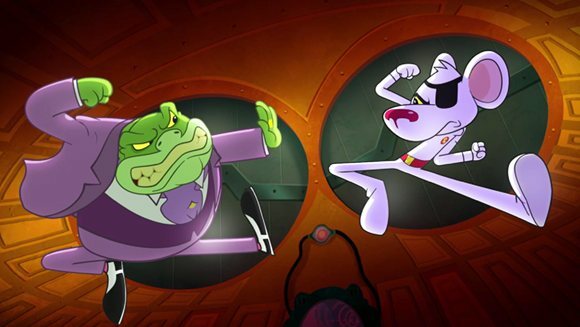 Although I know I'm not the target audience for Danger Mouse it was nice to see that those behind this reboot didn't insult those who watched the cartoon the first time around. Ultimately this was a show that provided something for everyone and I wouldn't be surprised if it got a weekend repeat on one of the main BBC channels so more people can experience its charm. That's your lot for now remember you can follow me on Twitter @mattstvbites and I'll see you next week for more of the same.